The birth of Prime Minister Erna Solberg’s long-sought majority government was anything but easy. Its two newest members are already bruised by internal conflicts that gave Solberg her new coalition by just one vote, and their new government platform came under immediate attack. Members of the deeply divided Christian Democrats’ national board ultimately voted to join Solberg’s government by a vote of just 19 to 17. That means that if there’d been a tie, the deadlock could have ended the government project Solberg has dreamed of since before the national election in 2013. Her minority coalitions have survived since, but she’s lacked the majority in Parliament that she badly wanted. 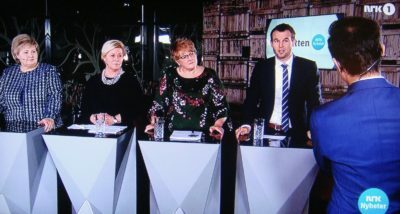 Norwegian media were reporting how Solberg barely won the Christian Democrats over with the new government platform hammered out during sometimes bitter negotiations during the past two weeks. Her victory came after alarms had been ringing, and after a stormy autumn during which the small but important Christian Democrats (who hold the swing vote in Parliament) debated among themselves whether to support and even join Solberg’s conservative coalition, or form a new minority coalition government with the Labour and Center parties. The latter proposal was initiated and supported by the Christian Democrats’ own leader leader, Knut Arild Hareide. He lost his bid for a left turn, though, and ended up resigning as party leader Thursday night when the party’s board narrowly voted to team up with Solberg’s Conservatives, the relatively far-right Progress Party and the centrist Liberals. Hareide also claimed he would not accept any ministerial post in the new government, and is widely expected to instead lead the Christian Democrats’ small but powerful delegation in Parliament. It could theoritically continue to cause problems for Solberg’s government if its members refuse to go along on certain issues. 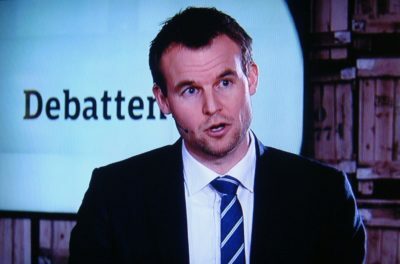 The Christian Democrats’ two deputy leaders, Kjell Ingolf Ropstad and Olaug Bollestad, have thus emerged as two of Solberg’s most likely new ministers, along with perhaps a third. 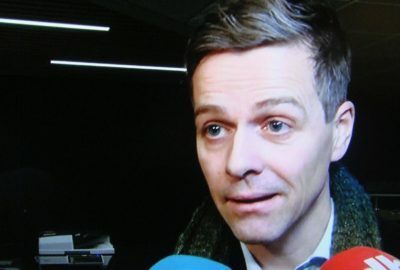 Ropstad led the Christian Democrats’ negotiations on a new platform as did Bollestad, along with Erik Lunde, who represents Hareide’s more left-leaning faction. He’s been tipped as a new minister as well. Negotiations over the new government platform, which was immediately blasted by opposition parties as being vague and widely open to interpretation, were so heated at times that Liberals leader Trine Skei Grande reportedly stormed out of meetings last weekend. Her small centrist party is also deeply divided, and state broadcaster NRK reported Thursday night that she also failed to win unanimous support for the new government platform from the Liberals’ national board. Seven of its 38 members voted against joining the government, but at least Grande won a majority. The new platform is based on four fundamental goals: Sustaining Norway’s social welfare system through economic restructuring, firming up the social welfare system, cutting carbon emissions and providing greater safety and security. 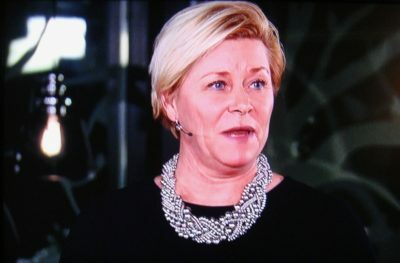 Solberg glossed over most of the platform’s details in her general anhas created the greatest controversy: possible changes in Norway’s abortion law. Solberg said all four parties agreed to remove women’s option of aborting a healthy fetus in case of twins, at the request of the Christian Democrats. “Beyond that, no changes will be made in the abortion law,” Solberg said, stressing that women retain their rights to free choice for an abortion in the first trimester and, in many cases, beyond that as well. The Christian Democrats had lobbied hard to further tighten Norway’s abortion law, with Ropstad famously telling party members who still oppose abotion that they had “an historic chance” to make more changes. Solberg claimed no further concessions were made, although opposition parties in Parliament object to the one change that looms, with Labour demanding that it come up for full discussion in Parliament. Only Solberg’s own Conservatives and, to a large degree, Finance Minister Siv Jensen’s Progress Party seemed to fully back the new government platform. Jensen claimed it was better than the revised platform hammered out last January, when the Liberals joined the coalition. She could proudly note that her party pushed through generally lower taxes and fees, more transport improvements that also address motorists’ interests, and continuation of restrictive immigration and asylum policy. A maximum of 3,000 UN-certified refugees will be allowed into Norway every year, she said. She also claimed that the controversial property tax imposed by local government will be lowered, with municipalities only able to impose property tax equal to a maximum of 4 percent of assessed property value. That’s down from 5 percent, but local governments keen to raise tax revenues have already responded by simply raising locally assessed tax values. That suggests property tax will remain an issue open to more debate. The Progress Party also won a reversal of a state budget compromise last fall that now ultimately will allow airline travelers to once against bring six bottles of tax-free wine home with them if they don’t buy and tax-free tobacco. The Christian Democrats had wanted to lower that just four bottles of tax free wine. It’s the bigger and arguably more important issues that may still be open to debate, also within the new government. Liberal Party leader Trine Skei Grance claimed that agreement had been reached on cutting emissions by 45 percent in the non-quota sector by 2030. Others wondered how that can be achieved when Solberg and Jensen claimed Norway’s controversial oil industry will retain its tax breaks and exploration opportunities on the Norwegian Continental Shelf. Jensen and Solberg argued the Norway’s controversial oil industry must be able to retain “predictability” over the years. The Christian Democrats, who currently hold less than 4 percent of the vote in current public opinion polls, claimed on its website Friday that the entire party should be proud of the new platform because it is “clearly anchored in our Christian and humane heritage.” It also claimed it won important family- and child policy reforms and funding for foreign aid equal to “at least 1 percent” of Norway GNP. In an apparent attempt to challenge the Center Party and appeal to Norway’s rural districts, the party also claimed it had pushed through its protectionist agricultural policies and support for the fishing industry. The Christian Democrats went so far as to claim that the new agricultural chapter of the platform is now “fundamentally different,” with policies meant to further support farmers, keep outlying areas populated, ensure domestic food production and protect farmers from the competition of cheaper imported food. The small party even went so far as to claim that the introduction to the government platform “sounds just like the Christian Democrats’ own program!” It’s unclear whether party members who wanted to cooperate with the Labour and Center parties instead of the non-socialist parties will swallow that, and they’re likely to continue pushing for more. 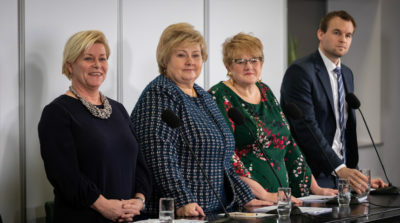 Details of the new platform were still emerging on Friday, with Solberg claiming that it contained “Good Conservatives’ politics” that would “secure Norway for the future and build a sustainable welfare state.” Solberg thanked her three government colleagues for their cooperation so far. Now it’s her job to hold them together, a challenge she has met when other earlier conflicts have emerged among government partners over the past five years. Solberg has a reputation for remaining calm in crisis and managing to get people to get along. She’ll be put to the test once again, as not least the opposition parties find fault with everything they can in hopes of blocking her next attempt at re-election in 2021.